Where did the inspiration for the store come from? Well, from the full and varied experiences of Karen Matthews. That’s what makes Details the great store that it is. In her twenties, Karen began building her expertise in furniture and design in her hometown of Toronto. Beginning as a commissioned sales person she moved from sales to visual display, eventually becoming a furniture buyer for a national department store. During this time she was travelling to markets in Canada, United States and Italy. Subsequently she transitioned to the wholesale end of home furnishings representing over a dozen companies with a territory covering most of the province of Ontario. After moving to New Hampshire in the late 80s, she worked for Gale River Sewing in Franconia. From seamstress to patterning to production manager, her sewing skills would become very handy later on in her window treatment and upholstery work. In 2000, after a few more small ventures, Karen began tailoring independently and was presented with a challenge by Steve Ray, who at the time owned the Deacon’s Bench. Could she transform old draperies into some cornice boards? From there, Karen became inspired to create Details Interior Fashions, which opened its doors in 2004. 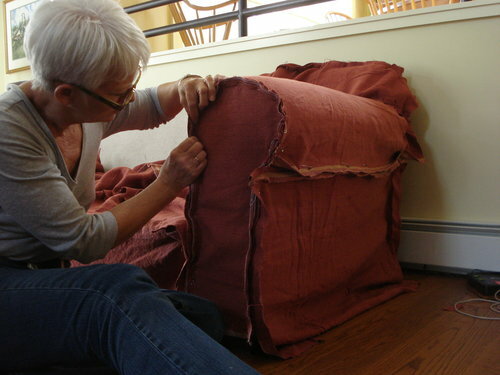 All of Karen’s expertise in furniture, design, and creative sewing all coalesced perfectly. Window treatments were the primary focus and now there is so much more! Karen has an eye for design, whether it’s figuring out how to make a room flow well, what it needs in color or lighting, or how to make all the pieces work together. She loves to help to create inviting living spaces that her clients love. Window treatments include shades, blinds, draperies, and pretty much any application on or around the windows. The goal is to find your needs and fit them with the perfect solution: create the privacy, add softness and warmth, control heat loss and/or heat gain, improve energy efficiency and comfort. In the ‘Fabric Library’ you are sure to find the perfect fabric for your window treatment (or upholstery project). And as one might expect, it is a lending library. Isn’t the place to choose your fabric in your home? Absolutely! Look to Details for high quality upholstered furniture from both Rowe and American Leather. This furniture is designed with the specs that you are searching for, with a wonderful array of fabrics developed for busy homes. Easy care and easily cleaned. The frame styles are also developed for modern life and some specifically for smaller spaces. Choose one of the beautiful pieces in the store, or work with the staff and design your own custom look and feel. Do you have some furniture that you love that needs some TLC, or perhaps an entire facelift? Reupholstery is another service done to perfection. If you want it to look entirely new, our sister store next door, reDesign, can recolor it. It’s amazing what a little bit of paint and new fabric can do for an old piece of furniture. We go deeper than just windows and furniture, though. We carry lamps, local art, and area rugs from Company C and natural rugs from Fibreworks. The amazing colors and textures are sure to liven up any space. This is Details Interior Fashions in a nutshell. In store you will meet Kaela, Carol, Karen and sometimes Kimberly. We’d love to see you. Stop by, check out our selection, and ask how we can help you create your dream living space.